on your first purchase above £99. Stay on coversandall.co.uk Go to coversandall.com? 10% OFF on Heavy Duty Tarps! 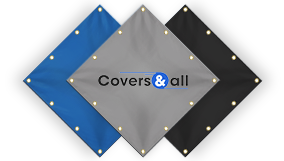 We cover anything! Don’t see the cover you need? We can create a custom cover for any size and shape. Our custom-made covers protect your belongings from harsh weather conditions and fit like a glove. We have a wide selection of fabrics and colors to suit any taste. Personalize your covers with your logo or name as well! I purchased a custom cover to protect my orchid potting bench. It fits perfectly! The quality is very high, it arrived on time and I am completely satisfied. Ordered a generator cover. The quality is excellent and the product fits perfectly. Excellent turn around and very good material. I will order from here again, buy with confidence! Custom cover for my electric smoker and stand were exactly what I ordered. I was very please with the quality of the product and fit. Great quality!! It is very roomy since they add an inch or two. The length came a little bit longer than I expected. In hindsight only, I would have gotten some tie downs to gather up some of the extra material. Arrived on time, fit perfectly. Arriving at measurements made simple by detailed pictorial on web page. Couldn't be happier! Very good quality cover and prompt service. Very easy to order as well. Just measure, choose your product, and place your order! Use our guide to submit your measurements. Choose your fabric, stitching, color, etc. Upload an image or text to personalize your covers. Place your order! It’s that easy. Your Custom-Made, Personalized Cover will be Delivered to Your Door!